Boon Bang Fai (บุญบั้งไฟ) is Month #6 of Heet Sip-Song – The Twelve Isan Merit-Making Traditions. Known as the Rocket Festival in English, Boon Bang Fai (literally "fiery tube") is one of the iconic elements of Isan culture. The largest rockets are four meters long (plus a longer tail section), hold 120 kilograms of gunpowder and climb several kilometers high (an airplane pilot once claimed to see one at six kilometers) at speeds of over 600 kilometers per hour. Though they're not seen very often, some places use round slow spinning rockets rather than the typical straight-line ones. The festival takes place at the start of the rainy season and the bang fai are launched to remind Phaya Taen, the sky god, that it's time to send the rain. The various legends behind the festival differ place to place, but most feature a battle between Phaya Khang Khok, the 'Toad King' (some versions have turned this myth into a Jataka Tale by making him one of the Buddha's pre-enlightenment lives, though the story is not part of the Pali Canon) and Phaya Taen who either refused or forgot to send the rains one time and the resulting drought brought widespread death and destruction. When their battle ended, Phaya Taen promised to always send rains from then on out. 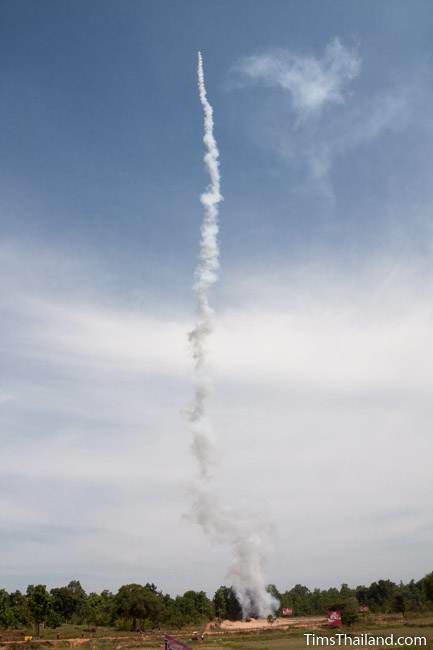 Rocket festivals almost always happen on weekends with parades and parties on Saturday and the rocket launching on Sunday. The first day is full of bawdry revelry, fully embracing the fertility aspect of Boon Bang Fai. And it's not subtle. There's lots of cross-dressing, giant phalluses, sexual songs, and suggestive teasing between friends and strangers; and everyone involved has loads of fun. In many places the procession of the rockets out to the launch pad has evolved into big parades with traditional music and dancing mixed in with the raunchy, wild side of things. The parade floats' mock rockets are usually decorated with a naga because of their association with water. The next day, after making merit at the temple, the rockets are launched. There are prizes for the rockets that go the highest while those whose rockets fail to launch get a friendly mud bath. The festivity masks the real danger of the rockets, and people do get injured, and occasionally killed, when they misfire – although the recent transition from bamboo to PVC has boosted safety considerably. While every village participates, they don't all have festivals – villages generally join together to celebrate. Because of marketing by the Tourism Authority of Thailand, the rocket festival in Yasothon has become the biggest and most famous rocket festival in Thailand. Boon Bang Fai has no fixed date and mostly occurs in April and May, but also sometimes in June.